When The Five of Pentacles appears in a reading it can suggest that you are experiencing hard times and feeling insecure. Poverty, loss, illness and deep loneliness are suggested by this Five, so it is not particularly welcome in a Reading. Your circumstances appear to have taken a turn for the worse. There is a possibility that you have lost substantially or taken a hard hit. The loss suggested does not always indicate financial loss, but because this is a Pentacles Card, it is quite likely that money matters are causing deep concern regardless of other issues. The deterioration may have been ongoing or very sudden. The crippled Figure in the imagery of this Card is very symbolic and carries many metaphors. 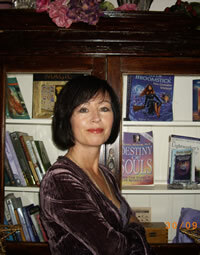 You may feel cursed, blighted or followed by bad luck that you just can’t seem to shake off. If you have been ignoring old debts, loans or mounting credit card statements then the Five of Pentacles is letting you know that they will follow you wherever you go, so it is time to sort out your finances. You will never make any progress until you do. You need to speak to someone who will give you good advice. You could find doors closed or slammed in your face due to your poor credit rating or reputation. You must work hard to restore it. Mistakes you have made in the past may have come back to haunt you or are eventually catching up on you. Remember, that you are not the only one in difficulties at present and that it is no reflection on you as a person. 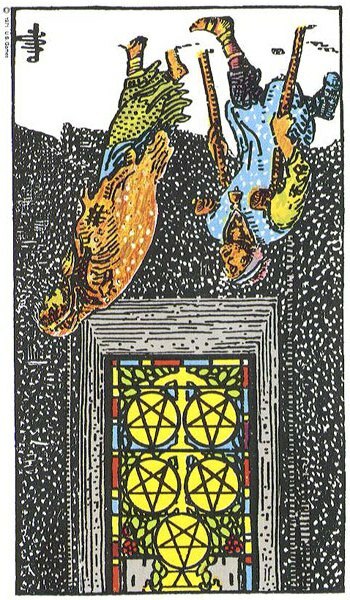 If you have been declining offers of help from family or friends, then the appearance of this card in your Reading suggests that the time has come to let others in. They do have your best interests at heart and know that you would do the same for them should the circumstances be reversed. That is what family and friends are for. They stand by you through the good and bad times. The above interpretation works both ways, so if you know of someone who is struggling and down on their luck, then you might be in a position to help them. They may be too proud to ask so you need to be the one to make a gesture and not make it look like you are offering them charity. The Five of Pentacles can represent the struggles of rearing a child on your own and all the financial obligations that come with it. If you have a child with an illness or special care needs, then this card can symbolise the stress, weariness and worry over providing for them. You may not have the finances for treatment or medication and feel lost, scared and alone. You may also feel tormented as a parent for not being able to protect your child from the ravages of disease or ill-health. In older times, the Five of Pentacles often represented the stain of being illegitimate or being the product of a scandalous and improper relationship. Being born out-of-wedlock ostracised one from access to normal acceptable society and severely limited one’s educational, career or marriage prospects. Like a leper, they would be considered social outcasts. If you have been used to having a certain lifestyle and healthy bank account then you may be feeling the pinch if it is all gone. Along with being financially challenged, you may also feeling emotionally and psychologically unstable as you find it hard to adjust to your new situation. Budgeting and frugality are just not your style but you may have no choice at present. You may be finding it hard to make ends meet, pay bills or keep up with mortgage repayments. Life suddenly becomes drudgery, and as the need to make cuts here and there increases, it might be hard to come to terms with it all. There will be a feeling of losing sense of oneself and identity as you have to make do with what you have, instead of buying new all the time. Like the two Figures in the Five of Pentacles, you may have to walk past the shops, stores, clubs and bars that you used to frequent because you no longer have the means to enjoy what they have to offer. Everyone has their own perception of what poverty and want means and how it would affect their life, so the scene depicted in this card could be reflecting genuine severe deprivation or just having to tighten the belt a bit. It is how it is perceived by the individual that is important so if you have been in a habit of ‘having and getting’ all the time then you will feel very poor indeed if you can only ‘have and get’ occasionally. Having to cut back from three vacations a year to only one, not being able to renew your salubrious golf club membership, letting one of your two cars go or having to do your own housework instead of hiring a cleaner may be your idea of times being tough. You may feel penniless and drab without all the ‘things’ you have been used to getting. If you believe you have nothing then you may have been basing your total happiness on money and possessions. The Five of Pentacles can be an indication that deep spiritual change is needed and an understanding that money is not everything and, most certainly, not a guarantee of happiness. Instead of being physically hungry, the hunger may be more on an emotional or spiritual level. You need to evaluate your life to see where the true feeling of deprivation is coming from. You may need to take a look around you, and certainly further than your front door, to understand what true poverty means. There are many people who would question why you are so worried as they would consider themselves very lucky indeed to have even a quarter of what you have. The Five of Pentacles can be a warning flag for ill-health and is a sign that you are neglecting your physical needs. You may feel run down and unwell if you are not eating properly or getting adequate rest. You may be abusing your body or letting others abuse it. You may be struggling with an ongoing illness and feel that you will never recover. You may have to go from consultant to consultant before you can get proper diagnosis and treatment. You must persist as there is treatment out there that can help. You just need to look in the right places and ask questions. If you have been used to having a strong constitution, then illness and weakness will feel alien to you. You may struggle on for a long time before admitting that something is wrong. It is not okay to put up with feeling unwell so you must let people know. The longer you leave it the harder it will be to treat. Remember that your health is your wealth and without it you have nothing. Then again you may be you caring for someone who is ill ? In a relationship reading the Five suggests a separation or loneliness within the relationship. You may have all you need materially, such as money and things but lack emotionally and spiritually. Inner change is needed here. You may be caring for a sick or handicapped partner and this is testing your spiritual beliefs. Financial troubles can be causing problems within the relationship. If your relationship is strong, then you will ride out the storm and this period of want and struggle will only tighten the bond between you. If not, then The Five of Pentacles can highlight shallowness in a relationship. You will need to question what brought you together in the first place as financial gain or status may have been the driving factor and not compatibility or love? Your partner may retreat from you, leaving you feeling left out in the cold, unwanted and unloved. On the other hand there is also a chance that you have been thrown out of the house for something you have done or something discovered about you? You may have come home to find all your possessions in black sacks out on the street. Friends and family may shun or disown you. The consequences of your actions may be drastic and extreme. You may have chosen alienation in favour of a relationship which others find questionable or improper. This relationship may result in you having to give up everything you have and everyone you know. In a career spread this Five would suggest unemployment and bankruptcy. Maybe the company car and all the trappings are gone with the job and all that is left is you. You may feel like a low-lifer as you claim unemployment benefit. The more desperate you get for a job, the more potential employers smell your fear and reject you. Down on your luck, you may feel the whole world is against you. Loneliness and isolation can intensify. If a business owner, financial ruin may be the order of the day. You may feel you are dragging along a struggling or failing business, throwing good money after bad. You may have to face up to the fact that your business has collapsed and taken all your savings and investments with it. After all the hard work and effort, all that may be left are debts and unpaid staff. Then again, if you were too caught up in the glamour and status of being a business owner, you may have failed to pay attention to the day-to-day running of it. Have you being guilty of spending more than was coming in? Where you throwing money around to impress? Did you not think to make provisions for a rainy day or did you believe that the sun would always shine? So-called friends and hangers-on may have vanished along with their free lunches and benefits. Who will stand beside you now? If career, ambition or lifestyle have driven you into ill-health or unhappiness, The Five of Pentacles can sometimes symbolise the turning away from the material world in favour of a simpler and more frugal existence. If you have been waiting for confirmation of acceptance into an organisation, club, college or institution then it is unlikely that you will be successful. Likewise, your mortgage or loan application may be turned down as the banks or lending agencies see you as a risk and unable to make your repayments. 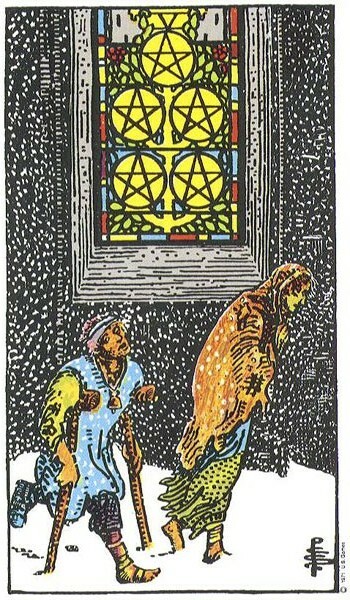 When the Five of Pentacles Reverses, the snow now at the top of the Card brings a brightness to your situation as the darkness begins to clear. The Stained Glass Window now resembles a doorway or passageway with the bright yellow Pentacles symbolising Light at The End of The Tunnel. Therefore, depending on surrounding Cards it is a welcome sign that change is coming for the better. It suggests that your financial or material matters are beginning or will begin to improve. The worst is now behind you but nothing dramatic is going to happen overnight. Short of a Miracle or sudden windfall, it is going to take time to find your balance again and get into a position of strength. This slow but steady stabilisation could be related to finances, property, possessions, business, health or relationships. It can mark the turning point you never thought you would reach. You have struggled through the hardest of times, endured and find that you are still standing. If you are still in dire circumstances, somebody may come to your help just when you are about to give up all hope of rescue. You may have to set aside pride in order to accept what is being offered. Slowly but surely, you are beginning to get your finances under control as debts begin to reduce and bills get paid on time instead of constantly being in arrears. The load and burden begin to lighten as you feel closer to standing on your own two feet. You have got to be congratulated for many others would have given up and collapsed under the pressure. With grim determination and possible stubbornness, you refused to let your circumstances break you. You have survived and this will only make you stronger in the future. You have also gained some valuable experience and have learned a lot from any mistakes you have made in the past. It is unlikely that you will find yourself in this situation again. You will either decide to live within your means from now on or build strongly on your resources to ensure that you can withstand any downfall in the future. This may have you returning to the Four of Pentacles in order to save long and hard. If the money is beginning to come in there is little chance that you will be running out and spending it immediately for you were caught out doing that before. However, do not let the miserly side of The Four of Pentacles take over. You must find a balance and not shut down altogether. Make sure the Bills are paid, money saved and then something left over that you can happily spend. Money is like energy, so needs to move around. Sometimes you have to spend money to make more. If you are emerging from financial hardship then you may see the world and the people around you with new eyes. This period of deprivation or struggle will have brought great spiritual development and awareness. You may feel more compassionate and understanding of others in trouble. If you have been helped or assisted by those around you then you may be determined to repay or do your bit to ease the plight of fellow sufferers. Your whole attitude may have changed and as a result the world has changed around you. The Hierophant, Card V of The Major Arcana is pleased that you have remembered your spiritual side during your trying circumstances. You may have been trying to force or control your situation but then decided to let go and surrender to it. Sometimes when you let go, the Universe steps in and everything begins to fall into place. You may view your losses now in hindsight with a deep understanding that what appeared to be a disaster was really a blessing in disguise. Without all the financial baggage and energy spent gaining an maintaining it you may find that you are a much happier person with less. You may also have discovered hidden strengths and abilities you never knew you had. Your life may be taking you in a completely new direction which would not have happened had you not experienced this tough time. If you have become estranged or alienated from friends and family, a thaw has set in and feelings towards you changing. You may be invited back into the fold and brought in out of the cold. Doors open to you now instead of slamming in your face as people accept, tolerate or forgive your situation. A slow recovery from a lingering ongoing illness can be represented. You eventually find the doorway that leads to correct diagnosis and treatment. 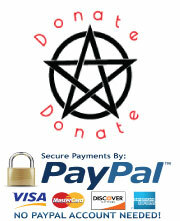 If you are caring for a sick child or dependent, help may be offered even if it is only practical and not financial. However, depending on surrounding cards, there may be a deterioration in your condition. A cure may be difficult to find or you may be slow to respond to treatment. Socially unacceptable or contagious illness may be involved. The Five of Pentacles Reversed can also point to degradation and abuse of the body. You would need to see what other cards are in the spread, but if the Devil, Reversed Nine of Pentacles or Reversed King of Cups appears with several Swords Cards such as the Eight of Swords, then prostitution may be a possibility, especially if homelessness is involved. In Relationships the Reversed Five of Pentacles can suggest a slow but steady improvement after a period of strife and disharmony. As a couple, you may now be appreciating the simpler things in life . This Five can represent a release from a person or situation that has been dragging you down. It may have felt like a long time coming but at last you are free. This relationship was unhealthy and destroying you on every level so do not feel guilty or bad about letting anyone down. Any relationships that were based on material status alone will naturally dissolve and much will be learned as a result. However, if this Card goes into the extreme aspect of the Reverse, then we may see couples being torn apart by poverty or struggle as self-esteem and pride plummets. If the relationship you are in has caused a stir or scandal, then the drama may have worn off as people begin to accept you as a couple. Then again, if you have forsaken all for the one you love, the Five of Pentacles Reversed can find you missing the life you had and all the benefits that went with it. Career related, The Five of Pentacles Reversed can suggest returning to work after a long period of unemployment. After your CV being constantly declined or rejected, a job offer comes your way and someone wants to hire you. This means a regular income again and the chance to sort out your finances. You can start to plan your life once more. In business, a financial rescue package arrives just in time, preventing the need to close down or lay off staff. Your struggling business is given a boost and you can begin to build on it once more. This will be a slow process, but there should be a steady determined confidence stirring in you that will get you through the remaining bumps and hurdles. It will also involve making some changes to your business and cutting out any unnecessary waste which is only a good thing. If you have been bailed out by a friend or family member there may be a realisation and understanding of what real friendship is. You now become aware of all who have selflessly helped you through your time of trouble. In the extreme negative aspect of the Five of Pentacles, poverty and want can worsen, health deteriorate further and major losses in businesses. Look to the surrounding Cards in the Spread when attempting to interpret this Card both Upright and Reversed.